There are 61 Kenya National Parks and National Reserves. The area for wildlife conservation is about 44,359 square kilometres or 8% of Kenya’s land mass of 580,367 square kilometers. The protected areas embrace various types of ecosystems namely: forests, wetlands, savannah, marine, arid and semi-arid. The protected areas comprise of 23 terrestrial National Parks, 28 terrestrial National Reserves, 4 marine National Parks, 6 marine National Reserves and 4 national sanctuaries. The protected areas are categorised either as parks or reserves. The distinction between the two categories is: in parks there is complete protection of natural resources and the only activities allowed are tourism and research. On the other hand in reserves, human activities are allowed under specific conditions. These activities are for instance firewood collection in terrestrial reserves or fishing in marine reserves. Kenya National Parks and Game Reserves is where both locals and tourist go to experience Kenya safaris and beach vacations. Holidaymakers usually book Kenya safari packages or tailor-made private tours. Kenya’s safari industry is backed up by an efficient tourist infrastructure with a dazzling choice of camps and game lodges to suit all budgets. This is, after all, where modern safaris were invented back in the Twenties. Masai Mara National Reserve has constantly been voted Africa’s best game sanctuary. It is Kenya’s most popular park and the best place in the continent to see big cats. The Mara as the Kenya safari park is also known is home to numerous wild animals, spectacular landscapes and more than 560 species of birds. Masai Mara National Reserve is also home to the annual wildebeest migration between July and October. During the migration over 2 million animals migrate from Tanzania’s Serengeti Plains to the reserve and back again in search of pasture and water. The reserve is also one of the best places to take a hot-air balloon safari. See more on the Mara. Also referred to as “The Kilimanjaro Royal Court”, Amboseli National Park is one of the most popular Kenya safari parks. It offers breathtaking views of Mt Kilimanjaro, Africa’s highest mountain. 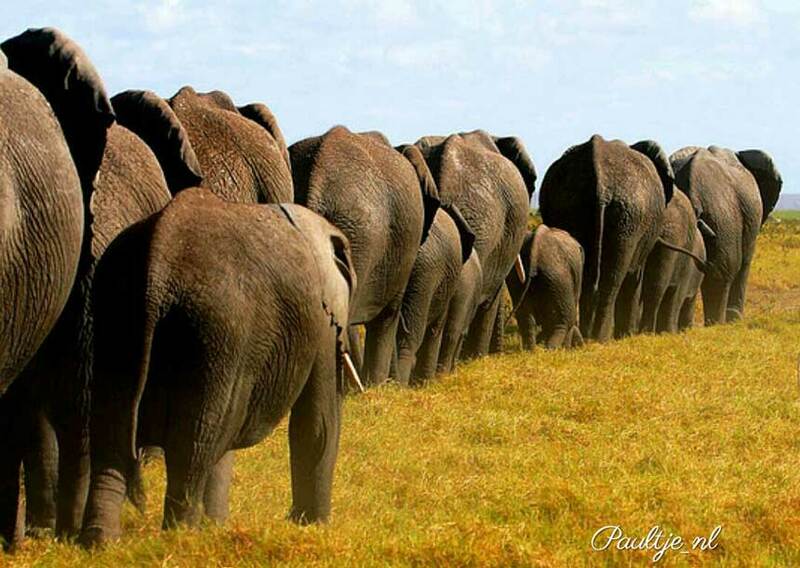 The park is one of the best places in Africa to view large herds of elephants up close. Nature lovers can explore five different habitats in Amboseli ranging from wetlands with sulphur springs, the dried-up bed of Lake Amboseli, the savannah and woodlands. They can also visit the local Masai community who live around the park and experience their authentic culture. Picturesque, steep forested ravines and open moorland characterise the spectacular landscape of Aberdare National Park. Visitors to the Kenya safari park can view African elephant, black rhino, leopard, spotted hyena, olive baboon, black and white colobus monkey, buffalo, warthog and bushbuck among others. Rare sightings include those of the Giant Forest hog, bongo, golden cat, serval cat, African wild cat, African civet cat and the blue duiker. Activities in Aberdare National Park include picnics, trout fishing in the rivers and camping in the moorlands. Bird watching is rewarding, with over 250 species of birds in the park. Nairobi National Park is Kenya’s first National Park and was established in 1946. It is situated 7 km south from downtown Nairobi. Although the park is not big compared to other parks in the country (117 sq km), it has a large and varied wildlife population including the endangered black rhino, lions, leopards, cheetahs, buffalos, zebras, wildebeests, hyenas, giraffes and diverse birdlife with over 400 species recorded. Nairobi National Park is one of the country’s most successful rhino sanctuaries. Visitors can enjoy the park’s picnic sites, three campsites and the walking trails for hikers. Mount Kenya National Park is situated about 175 kilometres northeast of Nairobi, the capital of Kenya. It was established in 1949 to protect the region surrounding Mt. Kenya. Mount Kenya is the second tallest mountain in Africa. The scenery surrounding this designated World Heritage Site is breathtaking. It includes endangered species of animals, high altitude adapted plains game, pristine wilderness with lakes, tarns, glaciers, dense forest, mineral springs and unique montane and alpine vegetation. Visitors can enjoy mountain climbing, camping and caving with the mountain’s rugged glacier-clad peaks providing the perfect backdrop. Tsavo East National Park forms the largest protected area in Kenya and is home to most of the larger mammals, vast herds of dust –red elephant, rhino, buffalo, lion, leopard, pods of hippo, crocodile, waterbucks, lesser Kudu, gerenuk and more than 500 species of birds. Tsavo East National Park occupies 13,747 sq km or 30 percent of Kenya’s total park area. A tour of the park can easily be combined with a beach holiday, as the park is only 153 km from Mombasa. Tsavo West National Park offers some of the most magnificent game viewing in the world and attractions include numerous plain game, diverse plant and bird species including the threatened corncrake and near threatened Basra Reed Warbler. Tsavo West is home to the infamous “Man-Eaters of Tsavo”. Visitors can view the source of Mombasa’s water, Mzima Springs, where over fifty million gallons of crystal clear water gushing out of from the under parched lava rock, the Shetani lava flows and other major geophysical attractions. The parks ecosystem comprises of beautiful rugged wilderness, open grasslands, scrublands and Acacia woodland. Among one of the popular Kenya National Parks, the park is situated 156 km northwest of Nairobi on the floor of the Great Rift Valley. The beautiful park is a bird watchers paradise and home to flamingo (Greater and Lesser), pelicans and more than 450 bird species. Wild animals that can be seen include white rhinos, baboons, waterbucks and buffalos. Visitors can enjoy the wide ecological diversity and varied habitats that range from Lake Nakuru itself to the surrounding escarpment and picturesque ridges. Lake Nakuru National Park is ideal for bird watching, hiking, picnic and game drives. Among the popular Kenya National Parks in norther Kenya the park has a pleasant aura of vastness and seclusion. It boasts more than 450 bird species, the Big 5 – elephant, lion, leopard, buffalo and rhino and the northern specialist species known as the Samburu 5 – the Grevy’s zebra, Somali ostrich, reticulated giraffe, gerenuk and the beisa oryx. The Kenya safari park is also the former home to “Elsa the Lioness” of the hit movie Born Free. Visitors to the park can visit the local Samburu community and experience their culture. The park is one of the utterly unspoilt Kenya National Parks. It is situated 148 km northeast of Kenya’s capital. Brilliant on a magnificent scale, the Meru and Kora sister parks feature luxuriant jungle, verdant swamp, coursing rivers, khaki grasslands and gaunt termite cathedrals all under the sky’s great blue bowl. The little visited Kenya safari park is home to numerous animals including Grevy’s zebras, elephants, Bohor reedbucks, Reticulated giraffes, Elands, buffalos, hartebeests and more than 427 recorded species of birds. Meru National Park is where George Adamson and Elsa the Lioness of the hit movie Born Free lived. Among the Kenya National parks in the Rift Valley Province, the park is situated along the Kenya-Uganda border and on the country’s second highest mountain, Mt Elgon. Mount Elgon is the eighth highest mountain in Africa. The Kenya safari park is dotted with caves formed from ancient lava tubes, the most famous one being Kitum, which is regularly visited by herds of elephants, as well as bushbuck, Red Duiker, Grey Duiker and buffalo, all in search of the salts that abound in the mineral-rich earth of the caves. Making’eny Cave, situated 1.5 km from Kitum Cave, has a spectacular waterfall over its mouth. Visitors to Mount Elgon National Park can enjoy birding, exploring the forest, biking and hiking. One of the Kenya National Parks in the Rift Valley, Saiwa Swamp National Park is 3 sq km and lies below the Cherangani Hills in Kitale. The park is the habitat of the rare and endangered semi-aquatic Sitatunga antelope and a preserve for the rare De Brazza’s monkey. Saiwa Swamp National Park is filled with exotic flowers, trees and birds. Water birds include the lesser jacana, grey heron and African black duck among others. The forest shelters Ross’s turaco’s, Gonolek and the Narina trogons, one of Kenya’s most spectacular forest birds. Among the Kenya safari parks that are ideal for a safari and beach vacation, Shimba Hills National Reserve is located in Kwale district 32 km from Mombasa. The reserve is one of the largest coastal forests in East Africa after Arabuko-Sokoke Forest, it is rich in flora and fauna and hosts the highest density of African elephant in Kenya. Other animal species found in the area include the endangered Sable antelope, elephants, giraffes leopards and serval cats. The forest is an important bird area and is endowed with forest birdlife while the grasslands hold localized species such as Croaking Cisticola, Zanzibar Red Bishop and red-necked-Spur fowl. The scenic Sheldrick Falls and the dense Mwaluganje Forest are also found here along with four campsites.